Gypsy Scholar: Kim Jong-un 'Pissed' While Purging? North Korean leader Kim Jong-un was drunk when he ordered the execution of two aides close to his uncle Jang Song-thaek, the Japanese newspaper Yomiuri Shimbun reported on Saturday . . . . [In turn, t]he Yomiuri cited a source that claimed Ri Ryong-ha, the first deputy director of the administrative department of North Korea's ruling Workers' Party, and Jang Su-gil, a deputy director of the department, were executed because they did not immediately follow an order by Kim to hand over their control of a profitable business to the military . . . . [Apparently,] when Kim made the order, Ri and Jang responded that they first had to report to director Jang -- the man in charge of the administrative department -- which made the young leader "upset" . . . . [Reportedly, w]hen Kim ordered the execution of the two aides, he was "very drunk," the source told the Yomiuri. The two subordinates were Ri Ryong-ka, first deputy director of the Administration Department, and Chang Su-kil, deputy director of the same department. According to the source, they did not quickly respond to the instruction by saying, "We need to report this to Director Chang." An enraged Kim Jong Un ordered their execution though he was "dead drunk" at the time, the source said. Touching on Kim Jong Un's alleged instruction, a South Korean government official said: "He tends to give instructions on impulse and without taking into account the reality. We doubt if he can maintain unifying power." According to concerned officials, Kim Jong Un issued an order to plant lawn[s] on the yards of citizens' residences to make the yards look like ones he saw in Switzerland during his stay in the country for study, although those [North Korean] yards are used as precious food[-]supplying fields for residents. He also ordered [underlings] to install parking lots on the premises of apartments to be built in Pyongyang by claiming, "An era of private vehicles has come." Further, WPK cadres were allegedly appalled when they heard Kim saying, "We can solve our food shortages if we eat meat instead of rice." And cake instead of bread. Assuming that all these reports are true (and I do have some skepticism), then baby-faced Kim Jong-un lacks the smarts for the calculations necessary toward retaining and maintaining power. 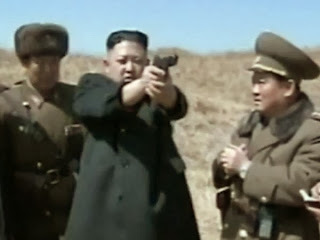 His immaturity and lack of self-control, exacerbated by appalling ignorance, suggests that he is not long for this world, for there are -- waiting from the sidelines and calculating their odds -- those in full possession of what the young Kim lacks. And they will be ruthless with him . . .
From the things I see and read inside and outside of your blog, young Un is a brat and bully. We all know what eventually happens to both. MERRY CHRISTMAS to you and your family! We have a light dusting of snow here in NWA for our Christmas Eve morning, but it will likely be gone by this afternoon, so no white Christmas for us. Exactly right about the young Un. Good thing we don't live under that sort of government and can enjoy Christmas freely. Merry Christmas, Jay and family! By all the signs, I'd wager Un's been sipping from the bottomless bottle of beer? "Un's been sipping from the bottomless bottle of beer?" I think so. That's precisely why I wrote that story -- as a warning! But some folks never listen! Christmas Comes Early For Uncle Jang . . .